After John Morrissey withdrew the best claimant to the American title was "Joe" Coburn, who defeated "Mike" McCool in 1863. In the following year Coburn Was to have fought with "Jem" Mace, then holder of the world's title for the second time, in Ireland. The unsportsmanlike conduct of Coburn, or his backers, broke up the match, and left Mace with the honors. Mace's position was further strengthened when "Joe" Wormald forfeited a belt to him, which he had won from Andrew Marsden, and when he beat "Joe" Goes in 1866. Mace retired. The scene of the big fights then shifted definitely to America, where for several years indecisive battles and counter claims confused the issue of the championship. Several so-called championship fights were mere wrangles; others were little more than conflicts between rowdy partisans armed with knives and pistols. 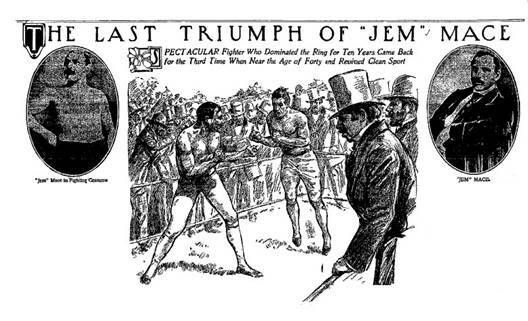 ;Fair examples of the two varieties were "Ned" O'Baldwin's "victory" over "Joe" Wormald in 1868, and "Mike" McCool's "triumph" over "Torn*' 'Allen In 1869. finally, in 1870, "Jem" Mace came out of his retirement and obtained a match with "Tom" Allen, the best available boxer In the American ring. IT was an enthusiastic gathering that filled the -special train out of New Orleans on May 10, 1870, bound for the spot where the championship of the world was to be decided once more Not since the great international contest between Heenan and Sayers had the pugilistic world looked so hopefully toward a promised test of skill or given proof so notably of Its faith In the possibility of lifting the game from reproach. "Jem" Mace, latter day exponent of the manly science developed by Its masters Mendoza and Belcher,.had come to America and had been matched with "Tom" Allen for $2,500 and the world's title. Mace was In every way the veteran of the profession. He was thirty-nine years old. As a youth he 'had been an itinerant Instructor In boxing. 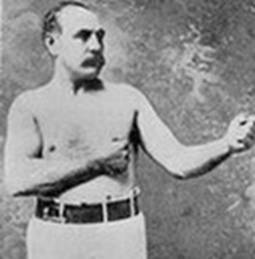 Before his two meeting with "Tom" King, In 1862, he had been prominent In the ring for seven years. He had fought thrice as many pitched battles as any other man Who then flew colors within the "squared circle." His circuit had included England, Ireland, Australia And America, And now, well past the boxer's prime, with an established and honorable record, he volunteered to restore the ancient traditions of the sport after a period of Confusion and disorder by one more honest test of manhood. Alien was the fittest opponent to dispute the great fighter. Born in Birmingham In 1841, he had the advantage of Mace by ten years. His career in the ring bad been busy and successful, Including a dozen fights before his departure from England and four in this country. A meeting with "Mike" McCool near St. Louis the preceding year had been broken up by a mob and he had lost the decision after leading all the way; but subsequent negotiations for another trial with McCool had ended with the withdrawal of the nominal champion and Allen was now in actual possession of the title. The special, after an early start, proceeded to a stretch of Open ground , where the ring was pitched near the river The crowd of one thousand, which included many well known fight followers from all parts of the country and from abroad, army officers and the members of the Chicago Baseball Club, ranged In orderly mariner about the ropes. Mace and Allen,who had followed the train on a dummy engine, were called forward by Rufus Hunt, the referee, and entered the ring with their attendants for a general handshaking. Mace was seconded by "Jim" Cusick and "Jerry" Donovan, and Allen by "Joe" Coburn and Sherman Thurston. At the stripping both men showed in magnificent condition, proof of long and faithful training. The spectators dwelt curiously and admiringly upon the wonderful physique of Mace, his trim muscle knobbed figure his brisk, lithe movements The old champion, full of the pride of body, had never allowed himself to get out of hand and revealed none of the softened lines and flabby rolls which might have been pardoned In one rounding his score of fighting years. His eye was as bright, his skin as fresh and firm upon the whipcord ridges, his pose as erect and easy as when he first snatched the championship. And with it all was the calm, youthful, confident smile that had overlooked so many stricken fields. He came to the centre at 105 pounds, just seven pounds over his weight in his fights with King eight years before. Allen was a man of hard, angular, powerful build, a more massive and formidable type than his opponent, Five feet ten Inches In height, overtopping Mace by more than an inch, he weighed in just before the fight at 173 pounds. His usual weight was 180, and the loss -of the extra flesh gave a gaunt, bony look to his heavy frame and long, muscular arms. His chest development was unusually good, high and arched. He lacked the fine symmetry and model proportions of the veteran, but appeared every inch a solid, strong and able. Mace won the toss for position and placed himself with his back to the sun, though, as proved in the past this advantage was of little Importance to so nimble a boxer.At the call of time the men came forward slowly to the center of the twenty four foot ring and their hands met for an instant in the final handclasp from which they whipped instantly on guard. Mace fell away with springy tread, studying his adversary, alert to every line of his attitude, every slightest indication of strength or weakness,then, advancing a cautious step, he slid easily into the tapping spar and whirl of fists with which he was wont ,to test his man. Allen met him speedily and well, though It was not in him to show the grace and deftness of the veteran. He was one trained to a rough handed school of Pugilism that had put aside many of the fine, scientific tactics of the art In favor of hard blows and tough bodies. In this "Tom" presented an ideal contrast to Mace, survivor of the third great period of fistic history , which produced, besides himself, such strategists as Sayers and King. Allen stood sturdily on his own ground, playing only enough to cover himself and watchful of the chance to hammer through with his heavy fists. Mace was here, there and around, circling, weight poised for advance or retreat, handling himself like the fast, compact, adjustable fighting machine he was. Arms and bodies flashed swiftly, silently, as the gladiators feinted and parried In their preliminary clash, constant applause from the eager spectators testifying to the keen Interest aroused by the skilful exhibition. Then, with characteristic suddenness, Mace moved In with a quick shuffle and swept over a stinging left to the right eye, stopped Allen's quick drive with sure judgment and repeated the blow to the nose before springing back. Allen's retaliatory swing passed him harmlessly and he was once more at his chosen distance, balanced, tense for any move. The slower Allen now showed a disposition to even scores and broke In a rush, driving right and left "Jem" warded both blows aggressively, met the charge with a side step, smashed a straight left to the ribs that stopped Allen dead in mid career and got away with his customary grin. ''Tom," it was evident, had no preconceived plan of campaign, and having been checked fell back upon the sparring once more, hopeful of drawing Mace within range. "Jem" met him In some rapid, light exchanges, pressing craftily on. Allen was awake to his chance, and lashed out sharply with right and left, tapping the veteran. Mace ducked the volley, worked in and shot his famous one two to the left eye and chin, like a compound flash of lightning. Those among the watchers who had seen him in former days knew that It was indeed the spectacular "Jem" Mace of old as he went through this maneuver . If there was one thing more than another In Mace's style that marked him a master It was his ability to get through a double smash and get away again in the space of a wink. He had not lost his cunning and "Tom" Allen could only wonder dazedly, as many another boxer had done, how and whence the blows had come. But "Tom's" chief concern was to make some adequate reply and he rushed again, whirling his powerful arms. He bore upon "Jem," beat down his guard with a crushing left pound and thrashed out a right swing that caught Mace high on the head and sent him staggering. The veteran was equal to the crisis. As Allen came on, set upon more work, "Jem" ducked, ran In unexpectedly, caught "Tom" skillfully about the body, planted a neat back heel and hurled the heavier man Over for a crashing, full length fall, while the crowd broke into wild cheering. The old champion's visitations had had a roseate effect upon the broad face of Allen, who came to the scratch for the second round with "Jem's" signature written all over him. "Tom" was plainly minded to change the state of affairs and pulled a serious frown as he flung up his guard. Mace was as chipper as a sparrow and twice as active. He approached his man, feinted rapidly at half a dozen points, got Allen twisted up In a desperate effort to follow him and stepped away laughing. "Tom" shook his head at levity so ill placed and stole slowly after his man. They sparred at a fast clip well out of distance, Allen on the move and "Jem" circling him and keeping away. Changing his ground sharply with a swift side step, "Jem" whipped through a smacking left to the mouth but took a heavy counter to the left cheek that had steam behind it. But "Jem" was away and light rallying was again in order. As they sparred "Tom" thought better of his earlier irritation and they chatted each other .merrily as the hands flew and the session; warmed. Allen suddenly brought up his reserves and hurled himself Into a charge, slamming right and left Mace was off and away, but "Tom" pursued tenaciously, warding two swings and launching a left drive that "Jem" just stopped. Again Allen let go his left, getting over the veteran's guard and planting neatly to the neck with a force that drove the lighter man clear away. Mace had no Intention of fighting on the defensive and came right back, meeting Allen's rush knee to knee, flashing through his one, two to the nose and the month, drawing back, smashing In again to chest and ribs. He was a thought too belligerent and threw himself beyond recovery by the last blow. 'Allen was quick to take the chance and hooked around a short shoulder jolt to the side of the head that set things dancing for Mace. "Tom" forced on, close after his man, driving right and left to the body and slamming with a wicked left swing that Mace shrunk around In clever style. Allen was still on the move and let go another left, bringing his guard over too far. In a flash Mace had popped In, taking the midarm of the swing and a wild, jamming right to the face, while he smashed a terrific left clip to the right eye. It was pretty fighting in the mixup, both boring for the body at deadly range and snapping short jabs to the ribs. Allen failed to ram an uppercut through, but lashed a stiff drive to the body as Mace,somewhat winded, tried to jump away from behind a slashing cut to the nose. Allen now went upon the warpath with a vengeance and came after Mace hard swinging and driving as "Jem" footed away desperately . When the big fellow was fully wound up in this manner he was to strong And too determined to stop except at great risk,and the veteran contented himself with blocking and dodging until at a favourable instant he ran in low and sought to grip.But Tom would not have it so. He brought both fists down on his man, slammed him away and landed hard on the side of the head. Mace was forced willy nilly Into sharp resistance, and as Allen came on he sprang to meet him with sudden fury, slashing one, two to either side of "Tom's" face and drawing crimson plentifully. Still Allen wanted trouble and still he kept coming, driving Mace from stand to stand with wicked swings. "Jem" pranced hither and yon, elusive and fast, blocking or ducking "Tom's" rather wild attempts until Allen, holding to his task doggedly, slammed through A tremendous left to the ribs. "Jem" was stepping in at the Instant and the sledgehammer met him full with crushing force. He gave, but met the issue in masterly style, leaping back at top speed with left to the right eye and right to the mouth. He was in for It now. Allen rained a torrent of jolts and jabs, keeping his man always within distance and finally swinging a jarring left to the neck. Mace cut him on the mouth at the same time and with mutual impulse they stepped apart, finding the mill too hot. The Real Test to Come. It had been a terrific round, but there was more to come. each man felt that the real test, usually developed much later in a battle, lay under their hands, and that the struggle for the lead, which is so hard to reverse if once lost, must be decided before the next truce. Allen was the first to resume hostilities, rushing with a vicious left swing, Mace blocked It and broke ground when "Tom" lashed out a hooking drive that caught "Jem" painfully on the lower part of the body. Instantly Mace's seconds were forward with cries of "Foul" There was no doubt that the blow had fallen Inches below the belt and the referee hesitated. But Mace, in common with all the spectators, knew that It was unintentional, and he rushed across the ring with protesting hand before the word could be given. He refused vehemently to accept a decision on any such ground, dismissed his seconds sharply and returned to the centre, while the crowd applauded him to the echo for his sportsmanship. Allen expressed his regret and they fell to once more. "Jem" went into action with a rush, leaping in and getting one, two to either cheek. Allen pounded him severely to the ribs and as Mace broke pushed after him, whaling a smashing right swing and catching "Jem" high to the side of the head. This blow, which he seemed able to get over "Jem’s" guard with good success , Lost its effectiveness through poor aim.It was Allen’s best move and he repeated It at intervals through the battle. If he could have brought it Down he would have battered "Jem’s" face to a pulp.as it was He punished his own knuckles on the veterans hard head with little Inconvenience to mace.After a brief short arm rally they stood apart again Before whirling back with renewed vigor. "Jem" now tightened his speed to the last notch and threw himself into the fray at whirlwind pace in a bold aggressive effort to bring the wearing round to a close.Allen slammed at him, but he blocked the blow hard and stung his left to the cheek.again Allen pounded at him.The veteran with a dazzling display of science held himself safe with his right and let out repeatedly with his left playing it like a whiplash across "Tom’s" face. Six times in as many seconds he got through that slashing left and when he was Through Allen’s face was sliced to ribbons.The last delivery, which had all the The wonderful fighters weight behind it, caught "Tom" full over the left eye, Whirling him of balance,The big fellow stood a minute weaving and waving his arms,then fell, ending One of the most brilliant and difficult rounds in which Mace had ever taken part in. Both men were exhausted by their extended struggle and came slowly To the center for the third round Allen had suffered fearfully about the face .his right eye was almost gone, his left was little better and he was covered with gashes.Mace was marked on the head and welted and swollen about the body.They sparred a moment when "Jem" leaped in with a hard drive to "Tom’s" left eye.Allen footedaway fast and Mace,carried by his own impetus, was yanked of his feet and dropped.The fourth session was equally brief, both sparring for wind until Mace slammed one, two to nose and mouth and fell. Somewhat restored by the lull in the wearing pace the men came together for more real Work in the fifth round.Allen especially seemed strong and anxious to regain the upper hand.He laid off handily with his left,grazing "Jems" ribs As the other sidestepped and countered with a neatly placed smacking Blow to the jaw.mace then changed his ground and circled,blocking Two more tentative bits,until he found his angle and leaped forward with A reaping drive to the nose "Tom" timed him perfectly and smashed a Tremendous left hander. But once again his aim was bad and what might have been a settler to the face struck solidly against the left shoulder, doing no harm, though it sent Mace spinning back across the ring like a manikin on wires. "Jem" had here a convincing demonstration of what might well happen to him if Allen should chance to place such a shot where it would count and developed a sudden strain of caution. He held off at safe range for some minutes, feinting and sparring and drawing "Tom" into several futile rushes, Allen drove twice at the body, but "Jem" kept off until, as they circled, he crept past another hard drive and planted a stinging rap flush to the nose. As he came on with a swift rattle of blows in usual style he tripped on his own spikes and fell heavily, but was up again instantly, refusing to end the round. Allen, aware of his adversary's new tendency to play safe, now went determinedly on the offensive and charged, reaping a stiff one to the ribs Mace turned in from it, took a ramming short arm to the face and clipped prettily below the left eye. "Tom" pounded him hard to the body and pressed on, milling and forcing "Jem" back. Finding himself once more on retreat, which was not to his advantage, "Jem" sought as before to check the other's advance by ducking and closing This time he was successful and the two clinched, trampling and struggling across the ring and falling together near the ropes, Mace on top "Tom's" tight eye was now gone and he was battered beyond human semblance He was also having trouble with his hands, which had reached nothing more Vital than Mace's head and, what were nearly as unsatisfactory to counter upon, his ribs "Jem's" immunity from face treatment was not by any means due entirely to Allen's faulty aim, for the veteran most warily and consistently guarded his face, fearing blindness more than any amount of punishment about the body. The sixth round was opened in fast style by Allen, who led off right and left, Mace breaking before him. "Tom" followed him toward his corner, when "Jem"suddenly circled and swept in with a snappy double smash to the face. Allen caught him prettily with telling rib searchers before he could get away, and seemed at last to have made Mace feel the effects of such artillery fire, for the veteran winced and hopped hastily out of range. Then, as "Tom" came on, milling, "Jem" dodged through with a wicked spank to the left cheek, drew down swiftly and closed. Allen, who was in no pleasant frame of mind from the treatment he had endured,lost his temper for a second and seized "Jem" about the thighs for a wrestle. "Foul" was again claimed by "Jems" backers,but the referee merely declared the round at an end and ordered the men to proceed. To the body. Allen sent a crashing right to the ribs, the veteran got in again With the double smash,landing hard to the chest and right eye. "Tom" fought back at him desperately ,driving right and left high. Mace deliberately aided his adversary faulty aim by lowering his head In the way of the blows and "Toms" fists rattled harmlessly , to his own inconvenience. "Jem" swept up under the heavy delivery with a pretty left Uppercut that smashed wickedly to the nose. Allen unable to make any impression in his Attempts at the head,now tried for the body,lashing out repeatedly. Mace blocked him,stopped a hard right in mid air and whirled in With his lashing left twice to right eye and throat.Tom outfought at Every point leaped upon his man and tried to bear him to the ground. Mace twisted in his grasp flung an arm around his neck and Hammered him with terrific jolts to the body.Allen found his right arm Free and improved the opportunity to pepper "Jem" about the face.there Was little advantage for either in such work and they fell together. Both men were badly winded and tired under the pace they had maintained And opened the eighth round with a sparring bout each waiting for the other to take the initiative. Mace,after studying the others condition, decided that his efforts must now be concentrated on the left eye,the right being satisfactorily closed.As Allen led off with a right swing to the side Of the head the veteran came back with a snappy left drive to that left eye And got away again to observe the effect.It was not quite to his liking and he slammed in again with the double rattle,just in time to catch a jolting hook to the ribs.He flung at the face,but Allen met him again, and Mace,to save himself, hooked his right arm as before about Toms neck and battered at the face.Allen wrapped the smaller man in his powerful grip and by a desperate heave tore him off the ground and threw him falling upon him heavily. There was more sparring at the opening of the next session, Mace having yielded to the promptings of caution In deciding not to give away a chance when he had the tide flowing his own way. Allen rushed and Mace stepped back as if, about to break sharply then ducked under a swing, came up and threw his right and left with great force to the mouth. Allen checked and staggered, and "Jem" swept on triumphantly, flailing with his left. But "Tom" was still dangerous. As Mace came In, sidestepping for a decisive blow, he gave just such a careless opening as lost him his second fight with King when that crafty fighter turned defeat Into victory. Allen saw it and put all his remaining strength behind a right drive. If it had been fair to the middle of the face "Jem" might once more have paid the penalty of over confidence. But it was high, as all Allen's upper work had been, and rammed home squarely upon the forehead the impact was terrific. Mace was lifted across the ground as by the swinging arm of a catapult, to crumple up against the ropes. The crowd gave Allen the tribute due his gallant effort to stave off the impending outcome, but when Mace picked himself up, though none too briskly, there Were few who saw any further chance for Tom.He was exhausted,terribly beaten and almost blind.Mace,on the contrary had undergone little surface punishment and save for weariness and some trouble with his wind might continue at this rate for hours. Allen himself felt the situation.he was not the one to enter into a protracted struggle he had no desire to fight a waiting battle,to shift and dally along in the Bendigo-Caunt manner, taking to grass when in danger and hoping for a slip or an error on the part of his rival.He was best at straight hard fighting exerting every ounce of power every minute until one or the other could do no more. His seconds whispered ring wisdom, exulting over his last blow and counseling a crafty game until he could get through another of the same kind. But Allen would have none of it he would go on at his best pace to the point where he could go no further. If he had not beaten Mace when the limit was reached then he himself was beaten. It was with this brave, dogged spirit that Allen threw himself into the tenth round, Into one more trial against the incomparable science and generalship of Mace. He entered it aware that If be fought as he had been fighting the end was near; but that was his method and the only one he understood. As he advanced Mace came to meet him, fresh and smiling, and opened the session by getting over his man's guard with a clean, cutting smack to the right eye. The blow had an effect upon which he had scarcely counted, for It acted quite as effectively as a lancet and Allen found himself temporarily with restored sight. The big fellow, pulling all his falling energies together, came after Mace with a rush. The veteran gave before him and then stepped in with the double hit to the left cheek and away again. Allen flailed at him, pounded on his guard, strove to reach him, but Mace out jockeyed him at every attempt blocked his desperate swings and finally rushed upon the offence himself. Allen could not hold him back Mace was all over him, slashed him heavily under the left eye, walked around him, pepped into the face, circled him again and jabbed him repeatedly In the ribs. Allen, lashing out at random, got a hard swing to the head, but it scarcely shook "Jem" who was now far in the lead and had the fight wholly In his hands After a brief breathing spell they joined again and Allen landed once more to the head. Mace responded by blocking "Tom" steadily and neatly with his right while he swept through his dreaded left three times to the face and left eye. Allen, already greatly weakened by his wounds, was cut afresh and retreated to his corner, where his attendants sponged him. Mace also took the opportunity for refreshment and came to the centre ready for a whirlwind finish. Allen was now tottering and the speediest way was the most merciful. Mace easily stopped the faltering drive venture by "Tom" and whipped terrific lefts to the nose,eye and jaw.Allen reeled but seemed about to recover when the veteran stepped in and closed with him and they went down together.The shock in Allen’s condition was as effective as a knockout, and Tom was unable to rise from his second's knee when time was called again. "Joe" Coburn then tossed up the sponge in token of surrender and "Jem" Mace once more stepped into the leadership of the sport, while the crowd cheered both conqueror and conquered. Allen bad been in the country several years and won his championship spurs by fighting Champion Mike McCoole. whom he defeated, but was robbed of the decision. Later he challenged! Mike, but as' he latter would not fight unless he had his choice of stakeholder and also referee, the affair fell through and Allen claimed the title by default. Mace came to this country the latter part of 1869 as champion of England and the two Britons were brought together to contest for the highest honors of the prize ring. The battle, because of the nationality of the principals, was not an International affair In the sense It generally Is taken, but It smacked of one nevertheless. As It was Mace's first fight in this country and the leading daily and weekly Journals In America had representatives on the ground, the fight by rounds probably will be appreciated. As they stood on guard, erect and defiant, their dresses unsoiled. their flesh glowing In the warm sunlight like polished bronze, as yet unpolluted and undefiled, an almost unconscious murmur of admiration ran through the anxiously waiting crowd. At the first glance it was evident that Mace had the advantage in condition, his flesh hard and healthy, while' that of his antagonist seemed a little too loose and flabby. Bets were now freely offered around the ring of $100 to $70 on Mace, but no reply was elicited. Jem and Tom both smiled beamingly on each other and then put themselves In position at the scratch. Mace's "walking beams" were In a constant state of terpsichorean movement, while his two formidable looking mawleys were most carelessly disposed. He fondled his chin, stroked his phiz, patted his "bellows," and conducted himself generally In such a mercurial sort of manner that to the unsophisticated observer gave no proof of the almost miraculous powers of the man. But his cunning was soon developed. Allen, as' he stood like before his adversary, wary and watchful, looked the splendid athlete that he was. His feet were spread wide apart and-his bunches of fives held artistically. They smiled and joked In an undertone as they walked around each other, with eyes firmly set on eyes and every movement sharply watched This sparring, dodging, and feinting lasted several minutes, each too cautious to do more than feel his man. Mace now and then dropped his guard, drawing Tom around after him. Then came a few sharp passes, neatly stopped. Jem landed a pile driver over Tom's left eye and danced back, avoiding the return. Again the scratch was toed, with another spell of cautious sparring, during which Allen shot a heavy one Into the ribs, which sounded all over the ring. Both men warmed to more rapid and serious work, exhibiting pretty science during a bout which wound up with Allen receiving a heavy hit on the nose, countering lightly on Mace's forehead. At it they rushed again. Jem making an ugly threat with his right, which Tom avoided, planting another ugly thud on his opponent's pumps, at which Mace clinched, a Quick tussle, and both fell, with Allen the under dog In the fight. Time, 5:3O. Several minutes passed In sparring for an opening. Mace rubbing his hands, folding his arms, and otherwise endeavoring to get Tom to lead off, followed by a few rapid feints, when, as quick as thought. Mace rushed In and delivered a poultice under the young "un's" right orb, raising an egg and springing back In time to catch only lightly a rib pulverizer from his opponent's, right. Jem grinned at his work and now fully understood Tom’s tactics. With hands down but ever ready to take advantage of any essay. Allen grew serious; he seemed, for the first time, to have properly appreciated his task and compressed his lips In a manner to show he was determined to throw all his energies Into the struggle and "die game," If .necessary. He planted another crasher on Jem's body in return for a nasty on the bad lamp, which now flickered, preparatory to being doused. Another long: Interval of cautious sparring ensued, during which both men blew off steam and contented themselves with watching for an opening, grinning and joking with each other in an undertone. Mace resumed hostilities with a shot at Allen's neck, but It glanced off, and he napped a return rather too close to meat cellar to be pleasant. Claims of foul were made from the outside of the ring, but Mace gracefully disclaimed them and went In for the finish, giving Allen a smash on the proboscis which drew first blood for Jem. Tom returned it by a couple of rib benders and a clip on the jaw, but in return received a terrible Sockdolager on the right eye which sent him down making a wild attempt to counter as he fell. Allen was now toted home by his carriers, mace walking to his corner much pleased. Bets of $100 to $30 were offered on mace with no takers.Allen came up dejectedly with his right eye nearly closed and his left showing an ugly cut. This Mace took advantage of by keeping the damaged observation well in the sun during the cautious last sparring which opened the round. Allen now found that something had to be done to utilize the time fast slipping away and essayed at the head, but Mace proved to quick, dodging and it passed over his shoulder. In the rally mace slipped and stretched himself on terra firma. Allen again rode home, Mace footing it in the best of humor. Allen looked worried and his face exhibited marks of severe punishment, bleeding profusely from a cut beneath the left optic, while his right look out was rapidly being shut by purple clouds. During the preliminary sparring Tom accidentally trod upon and spiked Jem's foot, but apologized, a courtesy which was loudly applauded. After an elaborate overture of feinting, guarding, and dodging, Mace suddenly, darted out his right and gave Allen a roaster on the damaged eye, distilling the ruby afresh and going down partly from the recoil just In time to escape a well intended receipt in full. After the usual Introductory fiddling about, Mace led. put with his left at the young "un's" neck, which the latter avoided, Mace going down from the force of his own blow. Foul was claimed, but not allowed. Jem quickly recovered, however, and faced Tom, who sent his left on a voyage of discovery, landing on Jem's ribs and getting a heavy return on the dial from Mace's left, who followed it up with a rush, clinched, and threw Allen heavily, adding his weight to the fall. The fight was now evidently all one way. Allen was game enough and glutton enough, but his Inferiority to Mace In sparring and In wrestling was plainly, not to say pitifully, apparent. Odds of $100 to $15, with no takers, were offered on Mace. Allen seemed freshening, while Mace was as smiling as a basket of chips. A few friendly passes preceded a clinch by Mace getting the young un in chancery and fiddling sharply with his right. Jem hung on like death but with one gigantic almost superhuman effort Allen turned the tide and went down heavily on top of Mace amid great applause, in which even Jem’s friends joined. Time now told badly on Allen’s telescopes, the right being entirely darkened and the other gradually followed suit. Mace’s face on the other hand was unmarked. Neither appeared to have suffered either in temper or in endurance. After another long spell of sparring Mace landed on the breast receiving an exchange on the ribs and countered on the mouth with severity.Tom dashed in, but Mace avoided his essay, clinched and they went down in a close and loving embrace. Allen was evidently tired and not at all hopeful but desparate.mace lively as a cricket, danced about his man, who waited for an opportunity to drive a spike into Jem’s boilers. He succeeded at last and got in two crashes, but mace squared accounts by hitting him heavily in the face thrice. They then rushed to a clinch and went down with a light fall. Jem underneath. Both men answered promptly and came up eager and determined.Allen with the exception of a bad eye, actually looked better and more dangerous than at any time during the fight.He still clung to the defensive policy as he did throughout the whole fight, not manifesting any desire to take the initiative. Both settled to hard work, Allen following up Mace as the later danced around him .An offer by Jem at the head was neatly parried and Tom dropped his right heavily just above the belt. Neither seeming In a hurry to resume serious work. They did get at it, however, and rattled away so fast that it was impossible to keep count of the blows. Mace had all the best of It, punishing Tom badly about the eyes and escaping: several vicious attempts. This could not and did not last long, and the men gradually edged away toward their respective corners, where they were refreshed outwardly and Inwardly, by their seconds. Mace had now 'gotten Allen's only useful eye in- proper eclipsing condition and It calmly awaited sunset. Allen, however, gamely marched up to the music, which opened with sparring. Tom finally got home on the breast—a crack Which made Jem wince and visit Tom’s right lamp spitefully. The men now closed and some terribly severe work at half, arm distance was in order, Jem finally getting Tom's head in chancery and slashing away at It with serious effect.This was not relished by Allen, who in order to stop it, clinched for the fall. The struggle was fearful like giants they swayed back and forward but Mace was to fine a wrestler for his game opponent. Holding Allen firmly in his vice like grasp, slowly but surely he bore his head down to the ground and threw him a complete somersault. Tom alighting upon his right shoulder with great force nearly dislocating it. Mace falling heavily upon him. Tom gave an awful groan and all ground the ring rose to their feet, thinking his neck bad been broken. Full of alarm, the seconds of both sides rushed up and he was carried to his corner. The Injury was not as feared, however, but was sufficient —the jig was up—-and when time was again called Coburn walked to the scratch and tossed up the sponge. Time of fight. 44 minutes. As soon as the referee had given his decision Jem walked over and shook hands with his opponent and while Tom groaned in agony he patted him on the back and said “Tom you are a game man and I wish you well”.